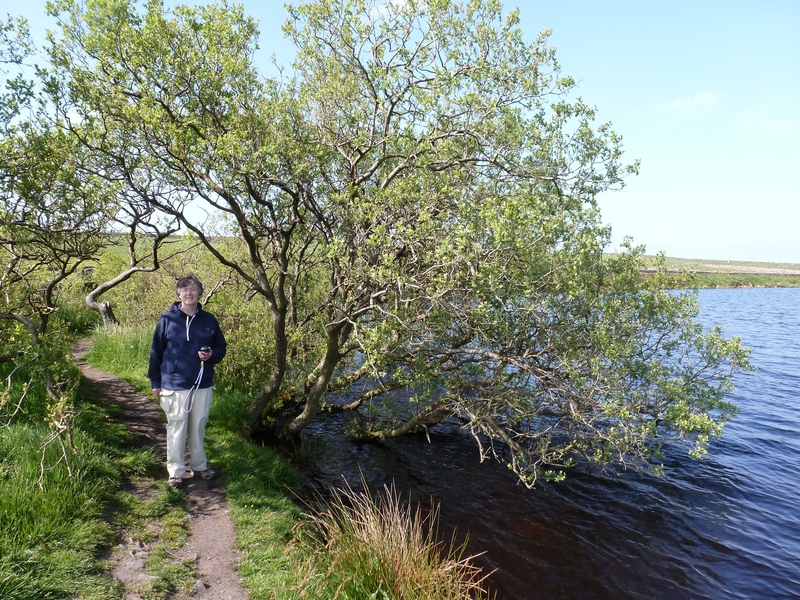 On yet another sunny day during our UK vacation we find some geocaches during our stroll along the three edges of Broadstone Reservoir. We also meet “3 Edges,” the geocache owner who placed most of them, and her dogs Millie and Becks. 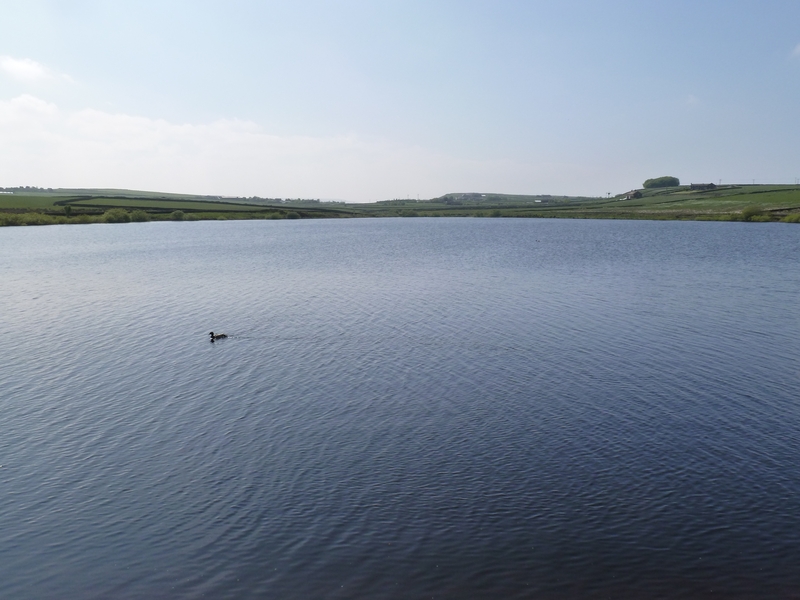 Broadstone Reservoir is a small body of water just inside South Yorkshire. 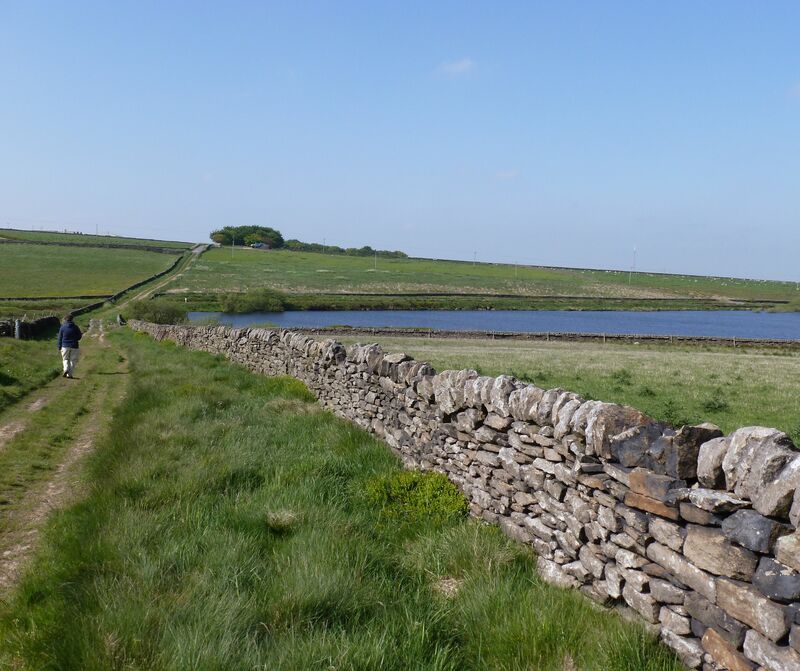 In fact, the South Yorkshire-West Yorkshire boundary looks to have been adjusted northward around the reservoir, perhaps, as dagdvm suggested, for water management purposes. 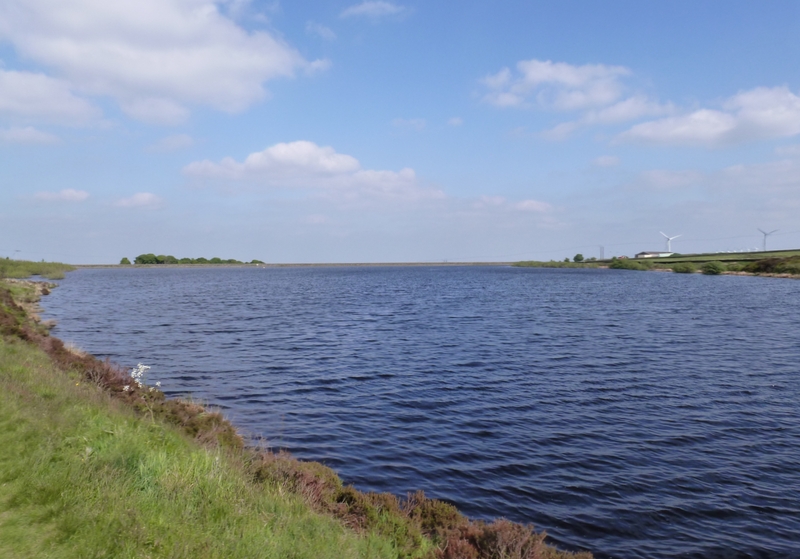 Broadstone is the first of a series of connected reservoirs (itself flowing into the Ingbirchworth Reservoir) that collect and feed water southeast down to the River Don. 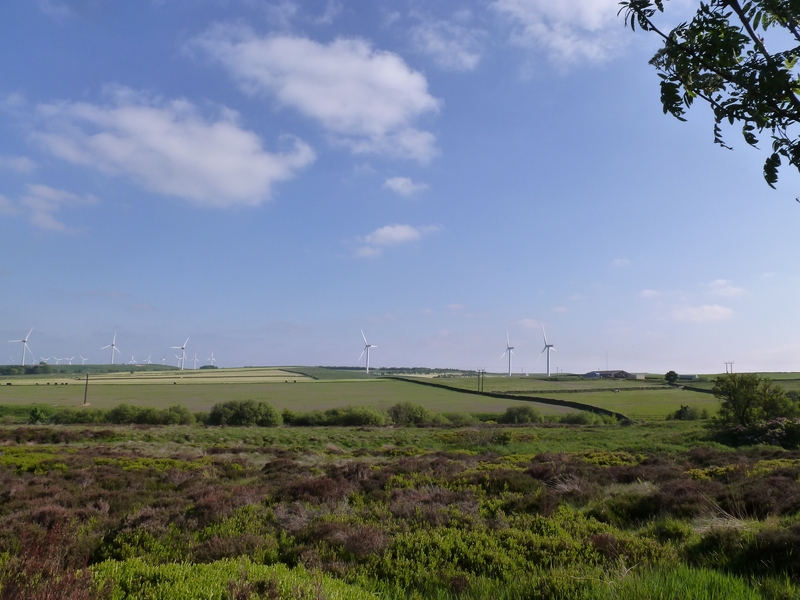 We made our way to Broadstone Reservoir from the east via Broadstone Road, which at that point separates South Yorkshire (to the west) from West Yorkshire (to the east). Look south from almost anywhere in the area and you’ll see part of a sizable wind farm, giant turbines turning over crops and pasture. dagdvm and I found all six geocaches in a great “birds of Broadstone Reservoir” cache series by 3 Edges, plus two other geocaches, during our afternoon walk. 3 Edges claims to have seen 73 species of birds on or around the reservoir over the years. We saw mallard ducks; heard a male skylark on high, lost in the pale blue; and saw probable oyster catchers along the reservoir’s north edge. We actually met and had a nice chat with 3 Edges while walking the south edge of the reservoir. We recognized her and her dogs from her geocaching profile. 3 Edges said she walks there nearly every day and she likes meeting geocachers as they search for her hides. Her dogs Millie and Becks were very friendly. As we parted company, 3 Edges wished us continued happy hunting — we’d found four of her six hides at that point — and dagdvm and I gave her one of our pathtags. 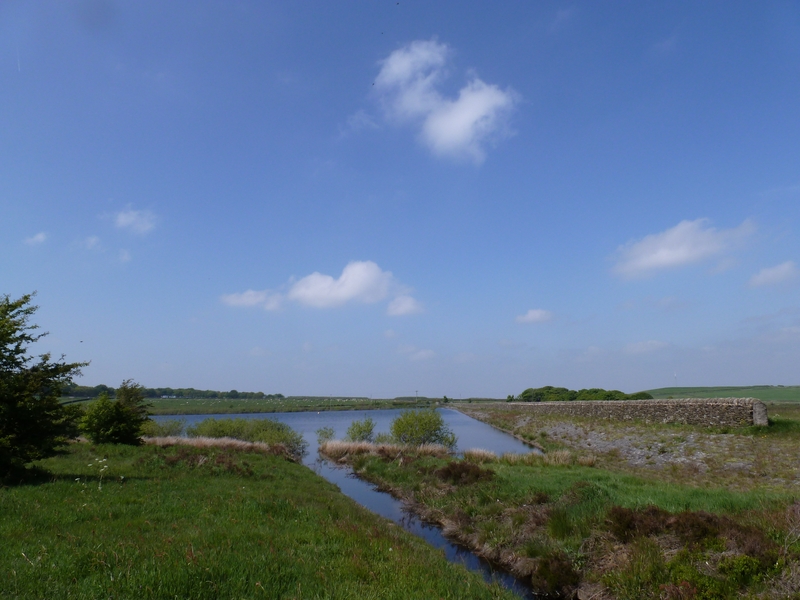 This entry was posted in found it, road trip, UK June 2013 and tagged birding, England, geocache, geocaching, Huddersfield, Ingbirchworth Reservoir, nature, Outdoors, photography, photos, River Don, South Yorkshire, travel, UK, West Yorkshire. Bookmark the permalink.